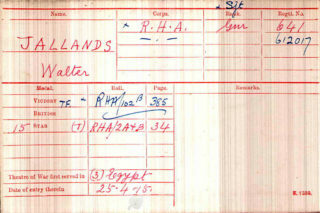 Letter concerning Walter Jallands reversion from Sergeant to Gunner, 1918. Walter Jallands is one of the men on the Bottesford ‘church list’ of WW1 Servicemen and is commemorated on the Roll of Honour, Bottesford Methodist Church. Walter was born late on the 15th November, 1889, the oldest son of Joseph and Emma Jallands. Joseph Jallands was born in 1860 at Dunston, Lincolnshire, and Emma Jallands (nee Asher, then Ward) was born in 1859 in Bottesford. They lived In Bottesford at 6 Mill Lane (1891 census), 6 Muston Road (1901 census) and had moved next door to 5 Muston Road by the 1911 census. Before 1911, they were recorded as ‘Jalland’ not ‘Jallands’. Joseph described himself in 1891 as an agricultural labourer, in 1901 as a ‘horseman on farm’ and in 1911 as a waggoner. The family would have grown up with working horses. Emma and Joseph married in 1886 and Walter was brought up with his step-brother Arthur Ward and step-sister, Arthur Ward and Martha Ward, Emma’s children from her previous marriage to Arthur Ward, and two other step-sisters, Harriet Asher and Mary E. Asher. Sadly Harriet died in infancy, aged 9. After Walter, Joseph and Emma had Sarah, Annie, Ernest, Herbert, Edith Emily, Cecil Henry, Ida Ellen, Albert and Hilda. As well as supporting their step-children, by 1911 Joseph and Emma were also looking after their grandson Cecil Henry (age 2) and 1 month old granddaughter, Ida Ellen. Walter Jallands enlisted on the 5th October, 1914, first with the Nottingham Reserve, but quickly posted into the Royal Horse Artillery 1/1 Notts. He was a Gunner – service numbers 641, then 612017. Twenty seven years old when he enlisted, he went on to give 5 years and 173 days service. His enlistment medical details (dated 5.10.1915) state that he was 27 years and 306 days old, weighed 152 lbs. and was 5ft 7¼” tall, with a 36 inch chest. His unit, the 1/1st, moved to the Middle East in 1915, where it joined the 2nd Brigade RHA TF in support of the 2nd Mounted Division. He departed for Egypt from Avonmouth on the 9th April, 1915, disembarking at Alexandria on the 25th April. During that year (1915), his unit served independently as part of the Western Frontier Force, fighting against the Senussi in the desert, having joined the MEF (Mediterranean Expeditionary Force) on 24.9.1915 and then the Western Frontier Force, 19.11.1915. 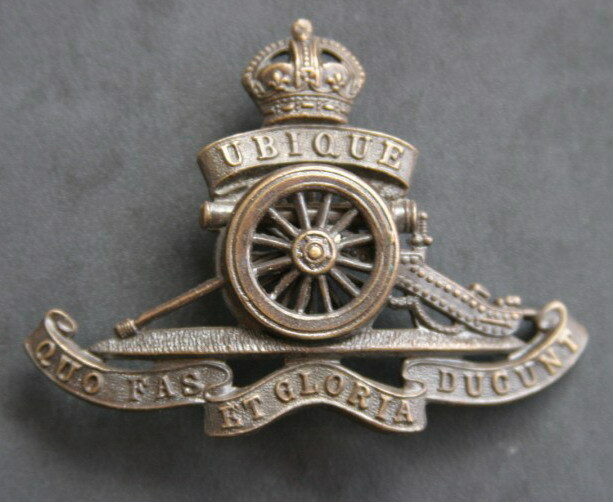 In 1917, the battery was moved to the 19th Brigade RHA TF, which provided artillery support to the Australian Mounted Division. His first promotion came in 6 months when he was promoted to Bombardier on the 5th May, 1916, in Alexandria. Within 2 months he was granted proficiency pay class 1 when he was on operations in Sollum. A brief stay in hospital in Sollum for orchitis in August of that year was followed by his promotion to Corporal on the 16th September. 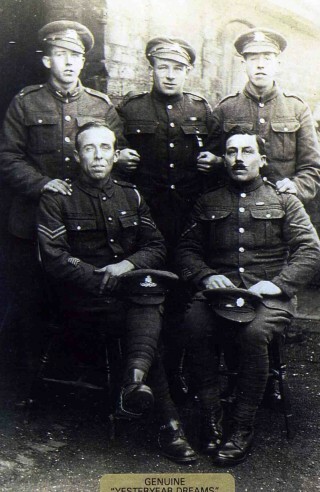 Further promotion was awarded in the field to Acting Sergeant, 2nd June, 1917, and then to Sergeant, 14th July, 1917. Then his records record that, on the 13th April, 1918, he was reverted to a Gunner at his own request. By this time he was on operations in Palestine. The records contain a handwritten letter stating that: “I certify that I reverted to the rank of Gunner from the rank of Sergeant on 11.4.1918 at my own request . Signed 612017 Gr Jallands 1/1st Notts. RHA”. 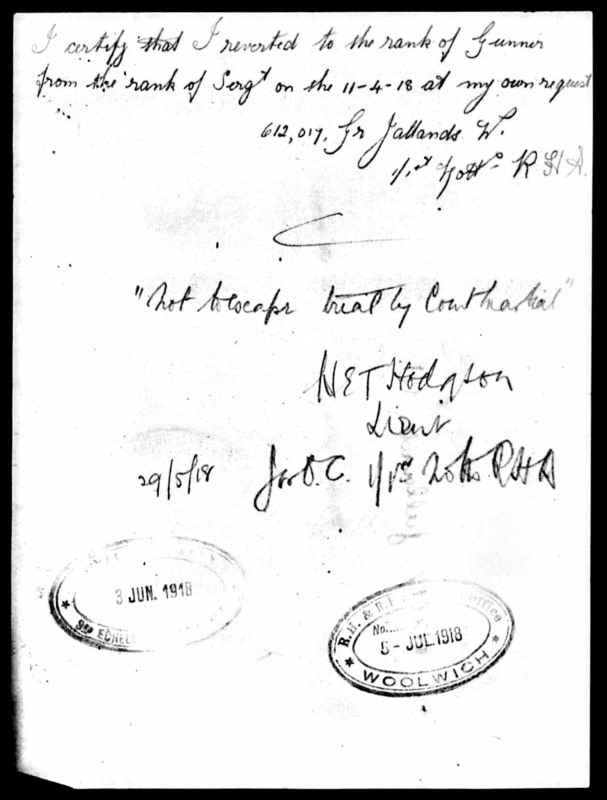 This statement is annotated with the words: “Not to escape trial by court martial”, signed by Lt. N.E.T. Hodgeson, 29.5.1918. Significantly there are no offences listed in his military record sheet. Within a month of this decision (13.6.1918), Walter was attached to HQ 19 Brigade RHA in Palestine and was formally posted to them on 10.8.1918 when he was also promoted back to Corporal. Over four months his role in the army had changed considerably, and it is unclear why there was this unusual turn of events. The relevant war diaries of the regiment are available but have not yet been made available in digitised format. The steps toward demobilisation were in place by 14.11.1919 when he had his medical in Tripoli confirming he was A1. His service in the Middle East ended on 25.2.1919 when he left Port Said on the P & O ship ‘Kashgar’. His demobilisation reference prepared on 29.2.1918 notes that his sobriety is excellent, and that he was reliable and intelligent. It specifically noted: “he is very good with horses and handles them well”. 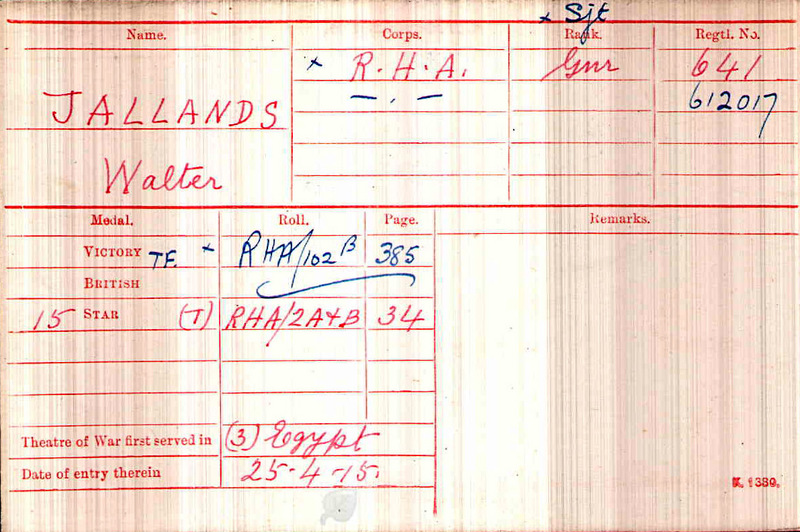 Walter Jallands left military service on the 10th April, 1919, with an advance of £2. His discharge record states, “is very good with horses and handles them well”. He was awarded the Campaign Medal of the Expeditionary Force Egypt, the 1914-1915-Star, the Victory Medal and the British War Medal. He is remembered on the Roll of Honour in the Methodist Chapel, Bottesford. Please follow this link for more information about the lives and WW1 service records of the Jallands men. In 1922, Walter was a mental nurse at the Nottingham City Asylum, Mapperley, lodging with his brother, Albert Edward. Both brothers were recorded as staff members. He married Nellie Walgate in that same year, and they set up home at 99 Quenby Drive, Mapperley. In 1s939, Walter (still listed as a mental nurse) and Nellie lived at 153 Hilton Road, Carlton, Nottingham, with their son also named Walter, born on the 30th September, 1923, and still at school. Walter Jallands died in December, 1956, aged 68, at Basford, Nottingham. Nellie Jallands probably died in 1984 in Nottingham, aged 88) (though there is also a record of another Nellie Jallands, who died in 1950 at Shardlow, Derbyshire).